Coursework afforded the opportunity to explore various areas of design: information design, design for social impact, environmental design, interaction design, and more. Starting with a topic, and through exploration of the use of data, research, social issues, and the use of reflection; apply the best practices of information design to explore the possibilities of data visualization and infographics. 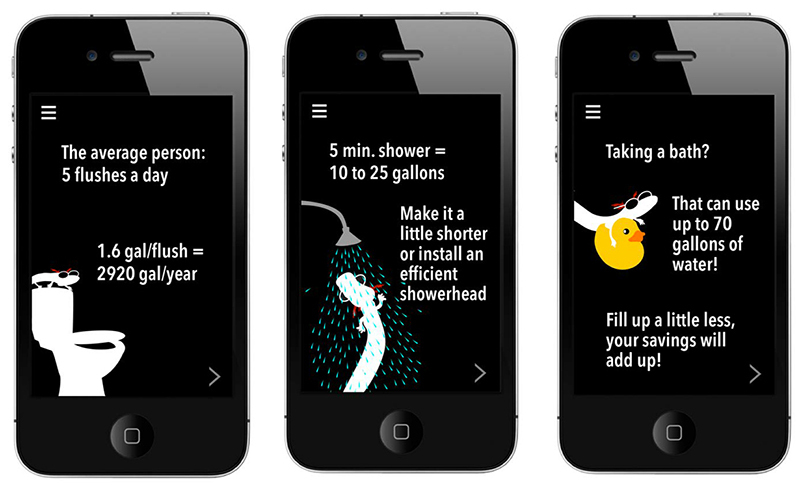 I researched water usage facts for residents of San Marcos, gathering data to work from. 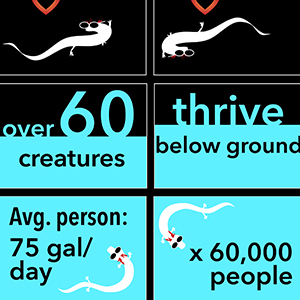 Working with the data and environmental facts, including the unique Texas Blind Salamander, I explored various approaches to quickly convey messages that would engage and inform viewers. 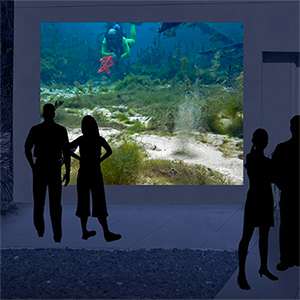 A messaging system that would give faculty, staff, students, residents, and visitors a sense of the of the Edwards Aquifer that provides water for everyday use and feeds the popular recreation spot, the San Marcos River. This project proposed the use of a digital sign in a public space to build awareness by sharing fascinating facts mixed with lighthearted imagery. Community outreach would share the same content via mobile devices. Identify a community partner, conduct research through immersion and observation, documenting the research process and outcomes for a process book, to be used to create designs/visuals to tell the story of the project. I chose Aquarena Springs, which had roots in San Marcos since the late 1920s, starting with glass bottom boats, a hotel, and later, amusement attractions. The park had aged into disrepair when Texas State University had taken ownership of the grounds in the early 1990s. I arrived as a new direction was being charted. I spent a lot of time at the site attending various events, observing and talking to people. To gain deeper insights, I devised a toolkit to help draw ideas out of the staff of Aquarena Springs. I provided a few simple prompts, snacks, and materials for them to record ideas. The toolkit with participatory activities proved to be an unexpected success. Staff appreciated having an outlet for their suggestions and ideas; they readily wrote notes, drew on a map I supplied, and provided examples of their own. This feedback, along with my own observations, led to a lengthy list of design ideas to help Aquarena attract visitors and make the transition to being part of the Meadows Center for Water and the Environment. Create an application for iOS that helps people create social change or solve a problem, through, networking, information sharing or curating. Lionfish are the scourge of the Caribbean! Thought to have been released off the coast of Florida, and with no natural predators, they are spreading like wildfire and reproducing at incredible rates while gobbling up other fish populations. This app is designed as an aid to divers who are trying to help fight the spread of Lionfish, making the process of recording catch data simple and fun. The original design was intended for an iPad, but changed to a phone because that was more likely to be used by divers in the field. 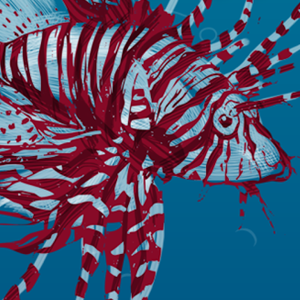 An iPhone app designed as an aid to divers, recording the catch data to be shared with the scientific and diving community, all working to limit the increase of lionfish. My research led me to Atlas who has long had the weight of the world on his shoulders. A woman could bring her wisdom and strength to share his burden; illustrating how women can make important contributions, just as men do. 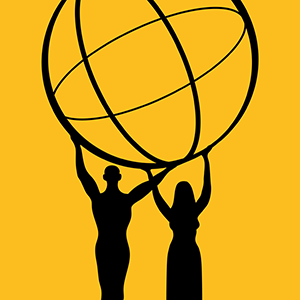 A graphical poster showing Atlas and his female companion sharing the weight of the world.